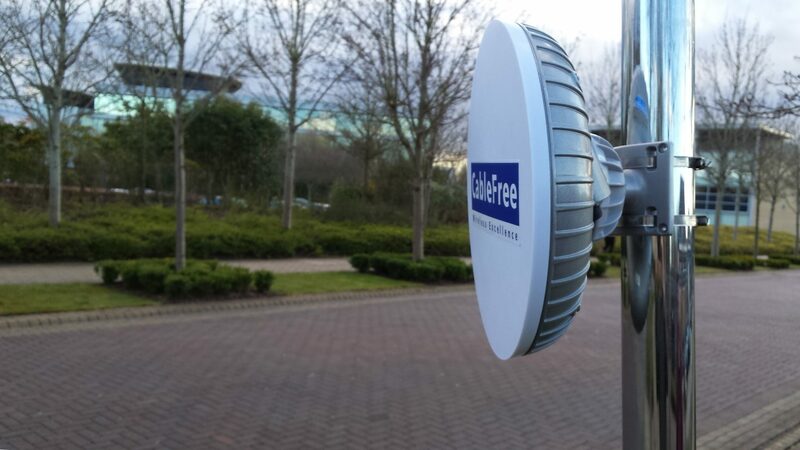 CableFreeMAX is a proprietary wireless protocol developed by CableFree for use with CableFree MIMO OFDM radios including AC-MIMO Amber Crystal. CableFreeMAX is based on TDMA (Time Division Multiple Access) media access technology instead of CSMA (Carrier Sense Multiple Access) media access technology which is used in regular 802.11 devices. CableFreeMAX is supported for MIMO and non-MIMO devices, which means that both “N” and legacy “A/G” devices can participate in the same network and it is not required to upgrade hardware to implement CableFreeMAX in the network. Media access in a CableFreeMAX network is controlled by a CableFreeMAX Base Station. The CableFreeMAX Base Station divides time in fixed size “periods” which are dynamically divided in downlink (data sent from BS to clients) and uplink (data sent from clients to BS) portions, based on queue state on BS and clients. Uplink time is further divided between connected clients based on their requirements for bandwidth. At the beginning of each period AP broadcasts schedule that tells clients when they should transmit and the amount of time they can use. In order to allow new clients to connect, CableFreeMAX BS periodically assigns uplink time for “unspecified” client – this time interval is then used by fresh client to initiate registration to AP. Then the Base Station estimates propagation delay between AP and client and starts periodically scheduling uplink time for this client in order to complete registration and receive data from client. CableFreeMAX implements dynamic rate selection on per-client basis and ARQ for data transmissions. This enables reliable communications across CableFreeMAX links. For QoS CableFreeMAX implements variable number of priority queues with builtin default QoS scheduler that can be accompanied with fine grained QoS policy based on firewall rules or priority information propagated across network using VLAN priority or MPLS EXP bits. Media access is scheduled by the Base Station – this eliminates hidden node problem and allows to implement centralized media access policy – The BS controls how much time is used by every client and can assign time to clients according to some policy instead of every device contending for media access. Reduced propagation delay overhead – There are no per-frame ACKs in CableFreeMAX – this significantly improves throughput, especially on long distance links where data frame and following ACK frame propagation delay significantly reduces the effectiveness of media usage. Reduced per frame overhead – CableFreeMAX implements frame aggregation and fragmentation to maximize assigned media usage and reduce per-frame overhead (interframe spaces, preambles). The CableFreeMAX protocol currently has a limit of 511 client devices per sector/radio interface.